Context Hemolymphangioma of pancreas is a tumor has its origins on vascular and lymphatic vessels malformation. At this time, only eight cases have been reported (PubMed). Case Report A 52-year-old woman with history of abdominal pain and early satiety was admitted to our external consultation. Laboratory data were normal. CT initially showed a high vascularized solid tumor, apparently arising from the right hepatic lobe, and it was considered to be a hemangioma. Two sessions of CT guided embolizations were performed. Control CT scan revealed a reduction in tumor´s size and location confined to pancreatic head. With this diagnosis studies and suspicion of neoplastic tumor, it was performed a pylorus preserving pancreatoduodenectomy. Pathology report was to be a pancreatic head hemolymphangioma. 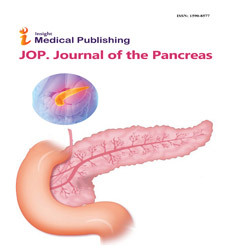 Conclusion Diagnosis and management of cystic pancreatic tumors can be challenging. Cystectomy or even surgical procedures aspancreatoduodenectomy should be performed when is possible. We report a case of pancreatic hemolymphangioma, a benign cystic tumor with a rare incidence.